Ultrasound to rule out pneumothorax is commonly used. However, there is not much standardization- some do single view, some protocols advocate 4 views of each hemithorax. Sure, you can imagine that if you do more views you might find more pneumothoracies, BUT are these important? Will you do anything for them? Maybe, maybe not. This study tried to look at only "clinically significant" pneumothorax to see if there is a difference when you select out the pathology you think might change management. The sensitivity and specificity of the two options are calculated for patients presenting to the emergency department with trauma. Is one view as good as 4 views for identifying clinically significant pneumothorax? Emergency medicine attendings and residents - all credentialed (≥25 FAST exam and ≥25 chest wall exams). Residents credentialed in both 1 view and 4 view protocols prior to trauma rotation. Everyone received an ultrasound and then CT chest. Most patients also received a 1 view supine chest xray. All of the clinically significant pneumothoraces except 1 that were diagnosed with four view, were seen on first view (so would have been seen on single view). 100% agreement with interpretation during review. 1. 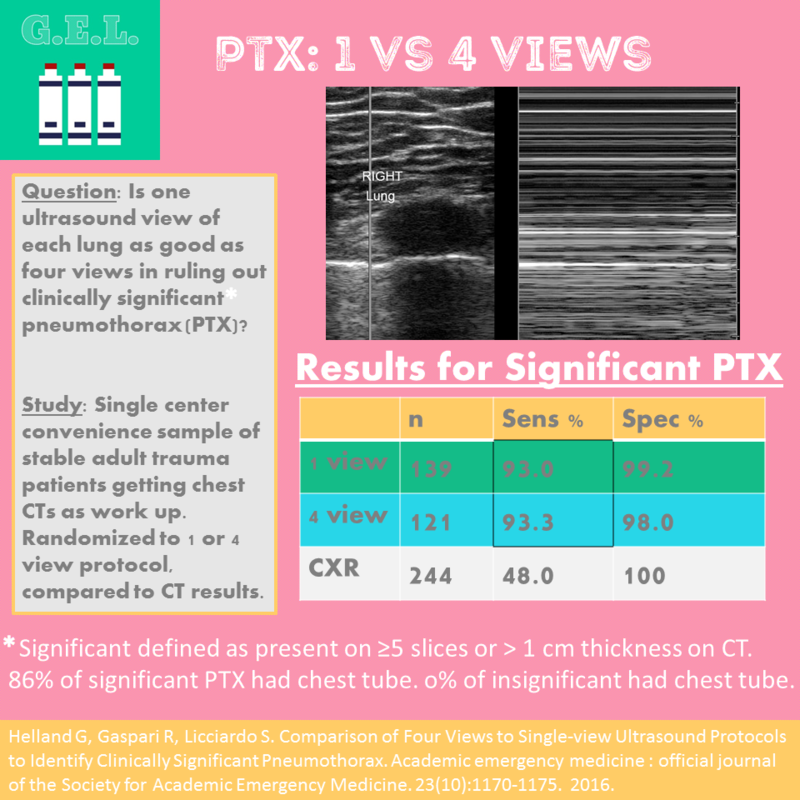 With regard to ultrasound for clinically significant pneumothorax in trauma patients, 1 view has comparable sensitivity to 4 views. 2. Don’t mistake mainstem intubation for pneumothorax.